The What: Coinciding with the recent release of the Matrox Maevex 6100 quad encoder card, Matrox Graphics has released Matrox PowerStream Plus management application and API. PowerStream Plus is designed to provide complete reach and control over the entire Maevex network topology through an easy-to-use interface. The What Else: Complementary to the entire Maevex line of H.264-based encoding and decoding products, including both Maevex 5100 and multiple-4K-enabled 6100 Series devices, PowerStream Plus offers users plug-and-play functionality and full access to the complete feature set immediately after download. PowerStream Plus features include auto discovery of any Maevex unit on the subnet, and easy manual addition for units outside the subnet; user management and feature control with credentialed profiles for any system operator; fine-tuned encode/decode parameters, protocols (RTP, RTSP, MPEG2.TS, with RTMP coming soon), and adjustable bitrates for any stream; manageable inputs and chroma sub-sampling pixel formats; preconfigured composite outputs such as picture-in-picture (PIP) and mosaic; record live or schedule recording to a shared network drive or NAS; identify and group encoders and/or decoders; adjust settings for multiple selected units and configure to the same parameters; and manage and save configurations to apply to other devices. PowerStream Plus is a Windows-based platform and will soon work on Linux and other operating systems. A separate Maevex Firmware Updater tool ensures users are always running the most current version of the software and allows for system-wide or chosen deployment from a single software tool. For those looking for customized control, the PowerStream Plus API grants integrators and developers command-level access to build their own Maevex control application or to integrate Maevex functionality in existing or even third-party applications. Based on the .NET framework (4.5 or higher) and featuring the full PowerStream Plus application feature set, the PowerStream Plus API supports a wide range of customization options. The Bottom Line: With an interface familiar to users, PowerStream Plus delivers discovery and remote control over all network-connected units from one central location. 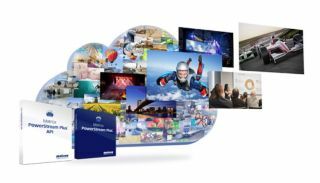 The Matrox PowerStream Plus application is available for free download from the Matrox website. The PowerStream Plus API is available to integrators and developers upon request.